work of Latin literature. Written in the epic meter, dactylic hexameter, the Aeneid follows the journey of Aeneas, son of Venus, after the fall of Troy. According to an ancient mythical tradition, Aeneas fled the burning city and landed in Italy, where he established a line of descendants who would become the Roman people. such close parallels to the Homeric epics that they are often called the “Virgilian Odyssey.” Books 7 to 12, meanwhile, closely echo the Iliad. Virgil’s use of Homeric elements goes beyond mere imitation. Virgil often places Aeneas in situations identical to those of Odysseus or Achilles, allowing Aeneas’s response to those situations to differentiate him from (and sometimes surpass) his Homeric counterparts. that of Dido and the origin of the strife between the Romans and the Carthaginians. that his fated land is in Italy. Immediately, he orders his men to depart. 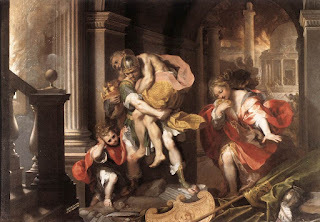 Dido is heartbroken over Aeneas’s leaving: She builds a pyre out of Aeneas’s gifts and commits suicide on it, prophesying the coming of Hannibal before she dies. When Aeneas descends to the Underworld in Book 4, Dido’s shade refuses to speak with him. Mark Antony and the civil war). Interpretations of the Aeneid are numerous and far from unanimous. The Aeneid’s composition coincides with the end of the civil wars and the beginning of Augustus’s regime. Virgil ostensibly endorses the new princeps by referring to him as the man who will usher in another golden age. Yet several elements of the epic might suggest that Virgil did not wholeheartedly support Augustus. Much of the debate centers on the war in Italy that occupies the second half of the epic, in which some scholars see a reference to the Battle of Perusia in 41 b.c.e., an event Augustus would have preferred to forget. Scholars also point to the end of the Aeneid, where Aeneas kills Turnus as he pleads for his life, as unambiguously criticizing the new leadership. This anti-Augustan view of the Aeneid has, however, met with opposition. Many scholars find more evidence of the Iliad than of Augustus’s campaign in the latter half of the Aeneid. Others suggest that in killing Turnus, Aeneas acted appropriately for his cultural circumstances. The Aeneid has also been proposed to represent, not Virgil’s view of Augustus, but rather the condition of the Roman people. Virgil seems to offer conflicting evidence for his perspective on Augustan Rome and may intentionally leave the matter ambiguous so that the reader may decide for him- or herself. the Thebaid, cannot surpass that of Virgil. The Aeneid became a standard school text of the ancient world and was a critical part of a good education. Virgil, however, considered the work unfinished. At the time of his death he famously called for the Aeneid to be burned rather than published. Augustus saved the Aeneid from the flames and ordered its publication.